Combating climate change will reduce the huge toll of 7 million deaths from air pollution as well as generating jobs in green energy, former California Governor and actor Arnold Schwarzenegger said in a surprise appearance today at the opening plenary of the 24th Conference of Parties of the United Nations Framework Convention on Climate Change (COP 24), in Katowice, Poland. 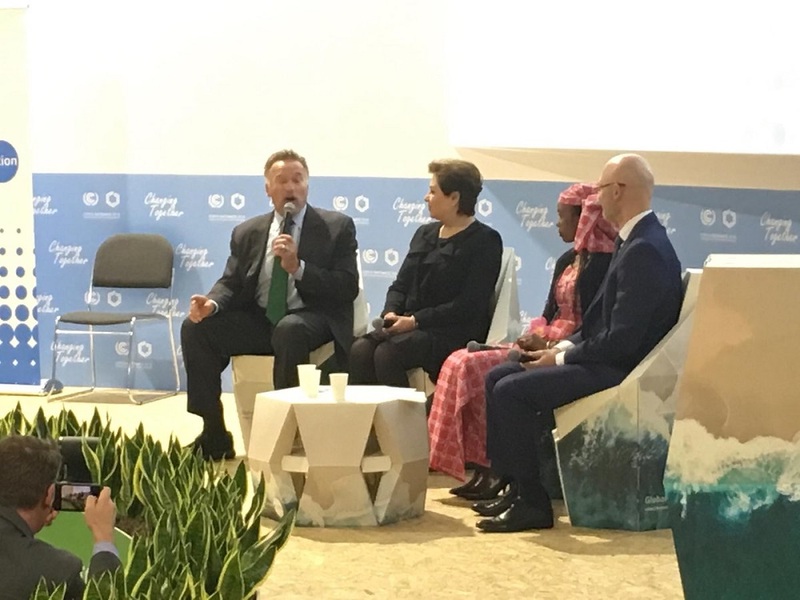 Schwarzenegger, who has become a leading advocate on climate change action, said that urban and regional leaders should be harnessed to the global climate effort, to ensure rapid action on what a string of recent reports have described as growing threat to health and economies as well as climate stability. “You are wrong when you say that the US has dropped out of the Paris agreement, because if you look a little bit beyond Washington, you will see that it is the states and the cities, the local governments that control 70 percent of our emissions, are still in,” said Schwarzenegger, who now leads a public policy institute devoted to tackling climate change and related issues. The webcast of his remarks is available here. “Yes we have a ‘meshugenah’ leader in Washington that is not in, that is out,” added Schwarzenegger, using the Yiddish term for ‘crazy’. Many health-harmful air pollutants, such as black carbon, also accelerate climate change, according to the World Health Organization. WHO has said that it will issue its own report on 5 December to the COP 24 Forum on ways to reduce climate change’s worst health impacts as well as maximizing health benefits of tackling climate change. The report was requested by last year’s COP23. Meanwhile, last week, a report on Climate and Health issued by the Lancet Countdown estimated that some 460,000 air pollution-related deaths a year alone are due to continued reliance on coal power production. The report also notes “disturbing trends” in heat and heatwaves, infectious disease and climate and food security. Coal burning is one of the most carbon-intensive forms of energy production. Poland is a major coal power producer, while many countries in eastern Europe, Africa, Asia, and the Eastern Mediterranean, either remain heavily reliant on coal power or have major coal power plants in the pipeline. From trying to impose stricter pollution controls on coal power plants under the previous Obama administration, the United States has recently become a staunch supporter of coal, under President Donald Trump, who has expressed scepticism about climate change, while stating that he wants to promote clean air and water resources. A string of recent scientific reports, meanwhile, have warned that time is running out to halt the runaway effects of large-scale planetary changes, that would harm health, food production weather systems and economies on a very large scale. A recent US government report, released a week ahead of COP24, warned that climate change could cost the US economy hundreds of billions of dollars, or more than 10 percent of GDP by the end of the century. The Fourth National Climate Assessment report was issued by the NOAA National Centers for Environmental Information over the Thanksgiving holiday weekend in the United States. Some recent scientific models warn that rapid loss of arctic and Antarctic ice sheets could make climate change impacts irreversible. Nations must triple efforts to even reach the 2°C ceiling for warming that was set out in the 2015 Paris Climate Agreement, warned the UN Environment’s “Emissions Gap Report 2018”, released last week. The chances of reaching a more desirable 1.5°C target are meanwhile, dwindling, the report stated, noting that Global Global CO2 emissions increased in 2017, after a three-year period of stabilization. If the emissions gap is not closed by 2030, it is extremely unlikely that the 2°C temperature goal can still be reached.